This week’s episode was a bit more entertaining as the ladies all pack up and head off Barcelona, Spain. 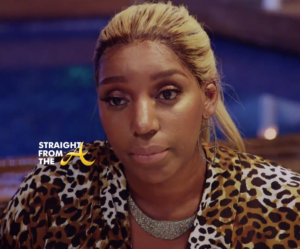 Shamea inquires about Kenya and Kim’s absence from the girls trip and Nene addresses that Kim was disinvited after trying to bring her husband along on the trip. Kim claimed that she needed Kroy with her for health reasons but Bravo treats us to a slew of clips where Kroy is sitting outside every time Kim films with the ladies. 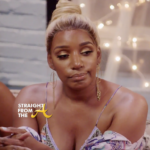 Nene also speculates during the ride, how Kim can be so negative all the time after surviving so many life threatening illnesses, noting she’s claimed to have had cancer, thyroid disease, blood clots, open heart surgery, a stroke to name a few. Bravo must have been listing to my suggestions because this week they were pulling from the archives. This time they grace us with a first season flashback of Kim claiming to have had cancer, then taking it back 2 minutes later. It’s clear that Kim has told a slew of lies throughout the years and she’s finally being called out about em. How many times must someone be warned about a person before they finally get the hint? Well, apparently that number goes to infinity with Cynthia Bailey. 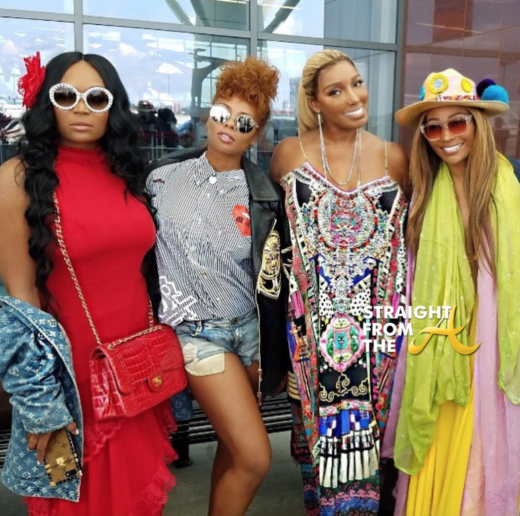 Cynthia and Eva finally get to discuss what transpired during Kandi’s Essence party and Bailey is still adamant that Will does NOT have a girlfriend. Why? Because he told her so. And she’s not willing to take the word of someone she met 5 minutes ago. Ummm… but didn’t she and Will meet 5 minutes ago too? I’m at a loss as to why Cynthia feels so defensive about Will. Oh wait… maybe it’s because we all clocked the situation for what it was earlier this season. I don’t think Cynthia was ready for the world to question whether she orchestrated this relationship for the show. She’s always been the sensible one and only Kenya would do such a thing in the past. But clearly times have changed. Whatever the case, Cynthia is riding a bit too hard for a man that she says is not her “man” and I think it’s because she doesn’t want us to know she’s still with Peter. Eva the diva has arrived! Eva arrived last week and it appears she’s here to stay! The beautiful ANTM alum even gets her own confessional this week. Eva arrived as a ‘friend of the show’ mid-season but it’s a bit out of the ordinary for “friends” to have confessionals. Case in point, Marlo has been on the show for YEARS and has never had one. So from where I sit, Eva has already secured a peach for next year. Now we just have to figure out who’s getting the boot. As for Eva, I think she’ll bring quite a bit to the show in a peach holding capacity. She’s comes with a family (fiancè Micheal Sterling and 3 year old daughter, Marley) a bun in the oven and a crazy baby daddy. What more could we ask for in a new ‘housewife’? She also blends right in and seems comfortable in front of the cameras. Well done, Bravo! Kandi is ready to battle with damn near everyone! “It was a scheme set up by Todd, to come at you with the bullshiiiiit!” That’s what I’m thinking about Kandi and her attitude this week. It seems like she’s trying to turn up because we’ve been calling her boring this season. I’ve never noticed how confrontational Kandi was before (since she used to be always crying), but now the successful entrepreneur seems ready to break a bish off at any given minute! Kandi and Marlo get into it. Kandi and Nene get into it. Kandi just wasn’t having it in Barcelona! Marlo goes head to head with Kandi when she calls Burruss out about her “dry” personality. 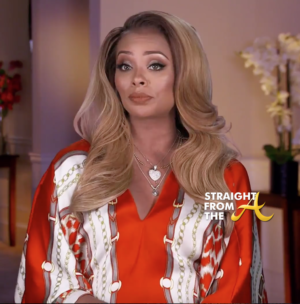 Hampton offers her ‘etiquette’ services and Kandi promptly turns her down but in turn blasts Marlo for being an antagonist and having lots of negative things to say about just about everyone. On a related note, Kandi also turns up on Nene at ‘Villa Victoria’ when Leakes suggests Burruss give her spacious room to the more “mature” hosts (i.e. Nene and Cynthia). “I’m not changing”. Not gonna happen. Kandi feels that Nene is trying to “Boss Up” and she’s not gonna fall for it. Sheree throws on her best gray sweatsuit to carry a few bones back to KKKim Zolciak. In a scene with Porsha and Shamea. 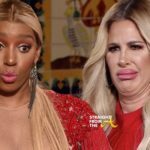 As previously stated, KKKim Zolciak gets banned from the girls trip after trying to bring her husband along but that doesn’t stop her from sending negative energy to the group all the way from the states! Sheree calls to tell Kim how Nene said she’s recovered from cancer, blood clots, strokes etc, and when Porsha says she didn’t know Kim was a cancer survivor, Kim goes into attack mode and says its all a lie. But wait… didn’t we see the clip??? Oddly enough, Kim had already related the cockroach message to Sheree weeks prior to Barcelona but Sheree was smart enough to let the words come directly from Kim. Sheree still gets the side-eye for riding for KKKim though, but I guess since she knows what it feels like to be broke, she’s doing whatever she can to secure that RHOA check. Hell, somebody’s gotta pay for all those collect calls from prison. Moving on. Nene Leakes is NOT HERE for the bullshiiiiii. When the ladies finally get together for dinner, Nene shares her zero to one hundred prayer for peace. Nene’s prayer was a great start to dinner since it’s already clear there’s gonna be drama. Marlo set Kim’s wig on one side of the table and Kenya’s crown on the other and everyone’s expecting SOMETHING, they just don’t know what. Meanwhile, Kandi and Marlo get into it yet again about Marlo calling her dry. While Kandi states she doesn’t care, she seems a bit perturbed about Cynthia bringing it back up. 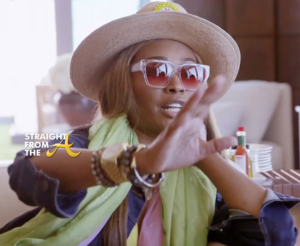 Cynthia also co-signs Marlo’s assessment of Kandi’s personality in a confessional. The ladies seem to be having a great time until all of their phones go off with a text from KKKim. The text consisted of the video from Brielle in Nene’s bathroom that sparked ‘Roachgate’. The text prompts Kandi to recall how Kim called her home “ghetto” which is why she’s no longer invited. When the video was first leaked, Kim swore up and down that she never sent the text and now we finally see she was lying. None of the ladies disagreed! The next lie Kim was caught in involved Nene’s rolls royce. Apparently Kim spotted Nene getting out of her car and decided to take a picture of where it was parked. All the while claiming to have never seen her at the mall. Bizarre. And a bit scary if you ask. If the tables were turned and it was any of those black women doing what Kim is doing right now, there would be hell to pay. Barcelona clearly brought out the truth about KKKim and her attitude. But again… Kim’s not racist. Why? Because her attorney said so.